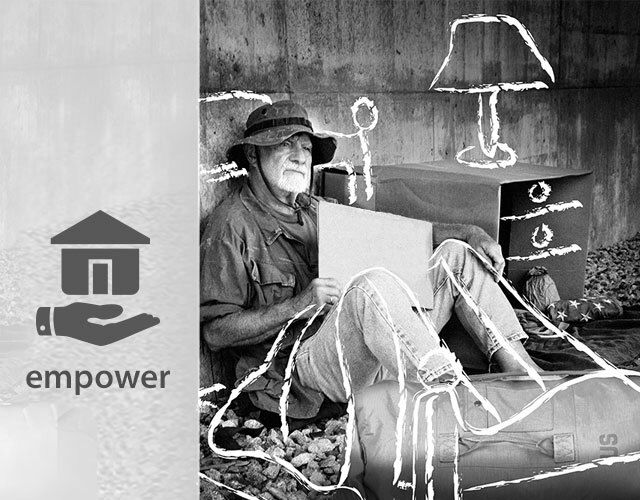 Stabilize housing and provide supportive services through emergency, transitional and permanent re-housing. Identify and develop “one-stop” community centers that can serve as 24 hour one-stop locations to provide access to crisis housing and linkage to coordinated entry into housing options, with veterans, individuals and families handled in separate locations. This would include support services to immediately address the need to take people that are currently on the streets to appropriate housing options. Implement a strong network of services and providers working within the center(s) to ensure the best delivery and integration of community services. Develop a Family Center specifically for the many single mothers and children that are currently sleeping on the streets. This site would operate similar to the individual campus, but will serve the women and children that are homeless, including families of veterans. Implement a Housing First focused system that includes enough Rapid re-Housing resources to provide permanent housing for veterans and families in our community and to quickly move people from the experience of homelessness into their own stable housing, within 30-45 days from the episode of homelessness.